We all want to be the best we can be… But how can we do that? Abraham Maslow, an American professor of psychology, had plenty of ideas about the subject! He believed that the highest state of being was the state of self-actualization, but in order to get there, there are a bunch of other attributes you first need to tick off. In fact, he believed that the attainment of confidence & positive self-esteem — what I like to call RADICAL SELF LOVE! — is an essential piece of the puzzle. If he was still alive today, he’d tell you that without a solid sense of self, you can never become all you are capable of being. Maslow was unique in his work because he focussed on how we can use psychology to make people happier & healthier. Before him, most psychologists only worked with the sick or so-called “abnormal”. Maslow took time to study the happiest & healthiest people he could find, in order to learn from them. From doing this, he concluded that man is basically good & that we all have a natural drive & desire to be the best we can. He found that we have a basic need to live a life that reflects our values, expresses our personality, & is in alignment with our personal morals & ethics. 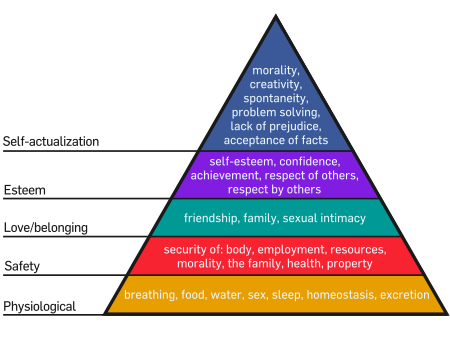 He created Maslow’s hierarchy of needs, which is depicted as a pyramid. The pyramid (below) shows that in order to achieve self-actualization, you need to have your physiological needs, as well as your requirements for safety, love & esteem, sorted out first. In other words, while it may be exciting to have a crazy, hectic & unpredictable life, in order to live up to our potential, we need to be healthy, to have a stable home, to have happy fulfilling relationships, to be self-confident & to have some kind of work. Self-actualizing people are less emotional & more objective, & they are all dedicated to a vocation or cause. Essential characteristics of the self-actualized include spontaneity, resourcefulness, gratitude (!!! ), creativity, courage & hard work. So… How many of those things do you have in the bag, & how many do you lack? Would you consider yourself someone who is on the way to being more self-actualized? So, what are some ways that we can evolve & proceed towards becoming more self-actualized? Luckily, Maslow wrote a LOT on the subject. In fact, he outlined the major tenets in his last book, The Farther Reaches of Human Nature. I’ve used his ideas below & expanded upon them with my own interpretation. I hope you enjoy them! If you want more information, please research Abraham Maslow & pick up some of his books! He was a fascinating man with a great body of work. 2. We always have a choice between growth & safety. Self-actualization is the process of making every decision into a choice for growth. When we choose safety, it is often because of fear, & it causes us to regress. Choosing growth, however, allows us to experience new things, opens us up to challenges & risk the unknown. At every opportunity, choose fearlessness (& growth). 3. Be prepared to be unpopular. As we become more self-actualized, we become more aware of our true nature & begin to align ourselves with it, as opposed to fighting or battling our inner selves. We start to make decisions for ourselves, instead of following popular opinion. In High Fidelity, the main character says, “It’s not what you’re like, it’s what you like”. Through the process of self-actualization, we begin to form opinions about the kinds of music, movies, books or ideas we like, & we start to care less about whether other people agree. 4. Strive to be ruthlessly honest. It’s always tempting to give answers that please others or make us look good, but when we do this, we regress. We need to look within & give truly honest answers. When we do this, we are also forced to take responsibility for our actions. This is self-actualization at its best! 5. Follow your instincts. A lot of us feel that we “don’t know how” to listen to our own intuition, but we’re just desensitized. Shut out external forces as much as possible, & let your own judgment, feelings & experience dictate your behaviour. Maslow felt that following our instincts allowed us to make more accurate choices about what is constitutionally right for us, ranging from better choices in art, music & food right up to decisions regarding the big stuff like relationships & careers. 6. Always be improving. Self-actualization is not the end of a journey, it is an ongoing process. We should always be using our intelligence & talent to “work to do well the thing that one wants to do”. Note: talent & intelligence are not the same thing as self-actualization — there are plenty of gifted geniuses who do absolutely nothing with their abilities! 7. Seek out peak experiences. Maslow said that “peak experiences are transient moments of self-actualization”, in which we feel more whole, more integrated, more aware of ourselves & the world around us. During these peak experiences, we think, act & feel more clearly; we are more loving & accepting of others; we feel less inner conflict or anxiety, & we are able to put our energies to good use. Apparently some people have peak experiences more often than others; Maslow called these people “transcending self-actualizers”! 8. Drop your ego defenses. It’s important for us to be able to recognise our defense mechanisms in order to become fully self-actualized. This is all part of the process: as we work to discover who we are, what we like, & what our mission is, we also need to be able to identify the ways in which our ego defends us. Once you know your defense mechanisms, you then have the opportunity to drop them. This will only spur you on to greater things! « alice + olivia & MAGNUM Ice Cream Shoot!